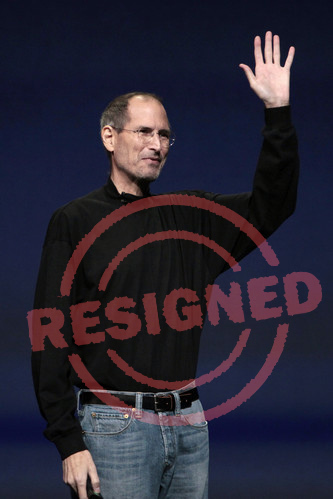 After several rumored to be resigning, finally Steve Jobs officially announced his resignation from Apple. He announced his resignation through a letter sent to the Apple board. Steve Jobs said that he was no longer able to continue his duties as CEO at Apple, Steve Jobs asked him later placed as the Chairman of the Board, as a director, as well as Apple employees. Steve Jobs pointed to Tim Cook, Chief Operating Officer (COO) Apple as a replacement. Steve Jobs himself supports the rapid advancement of Cook as CEO. In his resignation letter, he made ​​it clear that Cook was the first choice and has been recommended as a CEO at Board Director Apple's . During this time, Cook had indeed been replaced if Jobs absent, including the period of January to the present. In his resignation letter that Steve Jobs also stated that he believes that Apple will continue to thrive and innovate. He hopes to see this progress and continue to contribute to this success in his new position later. Not forgetting Steve Jobs also revealed that he found some of his best friend while at Apple, and thank them for working together with him so far.